Happy Tuesday, Girls and Boys! 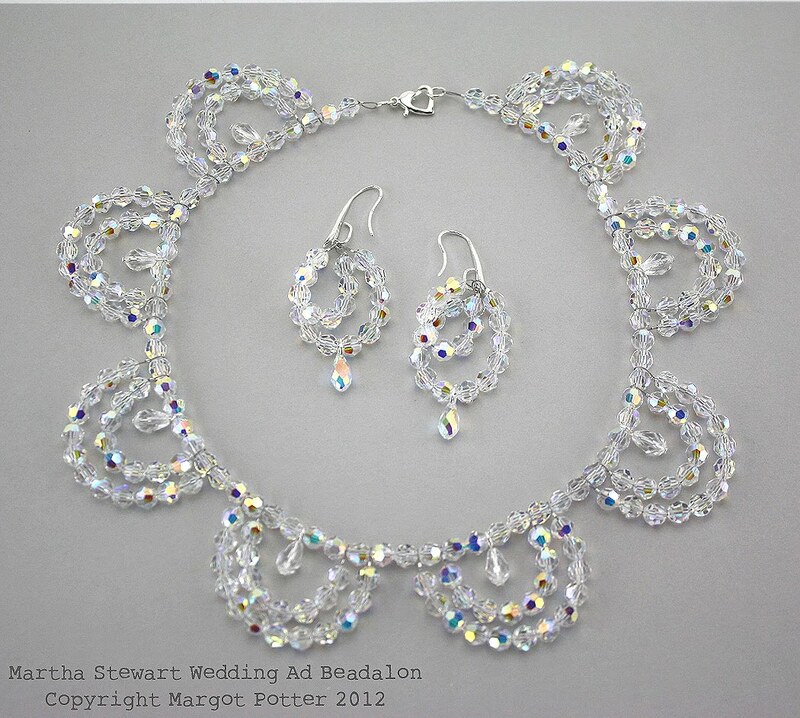 A few months back I designed a jewelry set for Beadalon using their 49 strand wire and a plethora of lovely SWAROVSKI ELEMENTS. Here it is, in an ad in the newest issue of Martha Stewart Weddings! 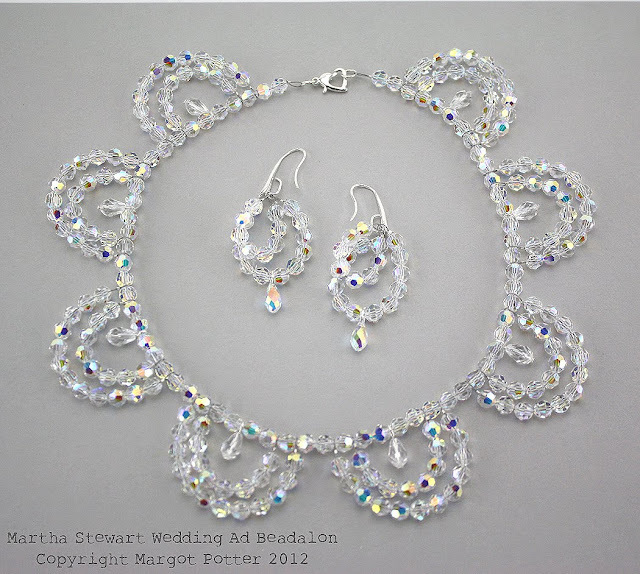 This collar necklace features crystal swags working around the neckline like petals on a flower. It feels divine when worn. The earrings are two ovals that work to make a three dimensional shape. I really love how they turned out. I kept the bracelet simple and added one lovely red heart crystal, which of course is a surprise for wedding jewelry, but I'm a romantic and I quite like that tiny pop of red. 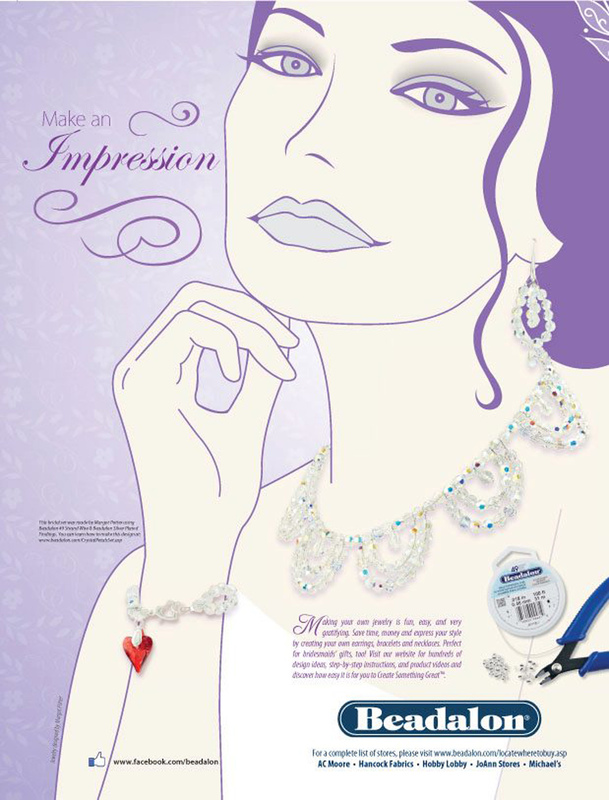 There are INSTRUCTIONS to make these designs at the Beadalon Website! Here is the link to the tutorial! I designed for Beadalon even before I had this 'accidental craft career.' In fact, you might say they discovered me! Or more aptly that Yvette Rodriguez from Beadalon discovered my work. This was one of my last projects for Team Beadalon and one of which I am immensely proud. All Free Jewelry Making blog! Follow this link for the details! I am off to dust off my pith helmet, time to prepare for a bold new adventure! 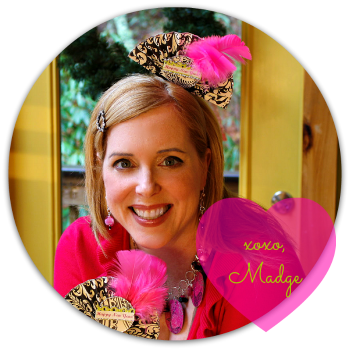 Exciting things are happening at Studio Madge! Soon I will share with the class! Love this simple yet elegant design of yours! I will try and make them using he crystals and one using my small round paper beads for eco chic elegance:) Thank you for the idea. This work is licensed under a Creative Commons Attribution-Noncommercial-No Derivative Works 3.0 United States License. All contents of this blog are under copyright of Margot Potter and The Impatient Crafter(tm). ALL RIGHTS RESERVED! A single image with a link back to this blog may be used but any other use of materials from this blog without our express permission is strictly prohibited. For questions, contact margot@margotpotter.com. This blog is dedicated to bringing you inspiration. Make these projects at your own risk and (hopefully) using sound judgment. Scissors are sharp, glue fumes can be toxic, tools can cause injury, please use common sense, ventilation and safety precautions. Projects in this blog are NOT intended for all ages and skill levels but for people 13 years and older who possess basic craft and cooking knowledge. ALCOHOLIC beverage related posts and tutorials are intended solely for use by people ages 21 and over. We do not condone the excessive intake of alcohol. Don’t drink and craft. We may, on occasion, use language that falls into the PG-13 category, if this offends, please accept our sincere apologies. We make no claims, explicit or otherwise, concerning the projects, products and advice shared on this blog. We take no responsibility for how you choose to use the information and ideas shared here at The Impatient Crafter. Craft, cook, sip and style responsibly. All Contents Copyright Margot Potter. Powered by Blogger.